In the last two Getting Smart With Space articles, we brought to you the latest solutions to maximise space in kitchens and bedrooms. As living spaces continue to shrink in UK homes, this article brings you the solutions to meet customer demand, whilst making use of every inch of space in bathrooms. 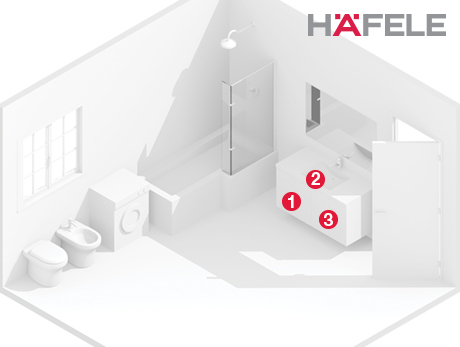 Find out more about shrinking living spaces here. 1. 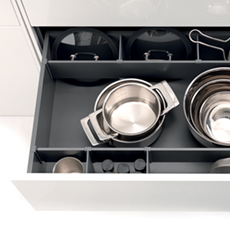 Grass Tavinea Drawer Inserts (551.87.970) – Make sure drawers are always organised and look good with a simple drawer organiser, whether they’re in the kitchen, bathroom or bedroom. View here. 2. 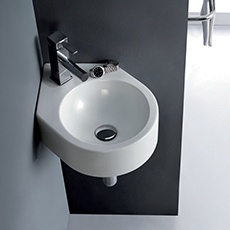 The Bristol cloakroom basin (588.66.220) is corner wall mounted which ensures exploitation of every inch of wall space, whilst still providing good sink capacity. Find out more. 3. 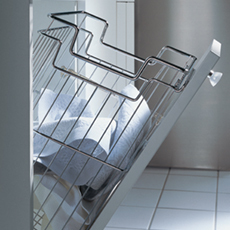 The Angled Laundry Basket (540.49.231)is designed to fit easily into cabinets, meaning laundry can be hidden away and floor space utilised. View product.